I saw this video on Youtube and it reminded me of the huge culture shock my girlfriend and I got on our first night in India. We checked into a hotel early in the AM and went to see sights around the capital Delhi. As we left the hotel we looked down the long road our hotel was on and saw some elephants coming our way in the distance. Wow, "We're in India," I thought, I guess elephants are normal here. my arm and said, "Sir, I don't want you to get the wrong idea about my people, we are a good people." "What do you mean?" I asked. "Who are your people?" "I am of the Sikh religion, and I am a professor. This is why I am telling you." he said as he disappeared into the crowd. As we got to the street where I hoped our hotel was we heard music, and singing; a lively parade was going down the street; it was now dark. The road was thick with people on foot but also elephants and cars and buses and flatbed trucks, all with people on them shrieking and throwing candy (ouch!). 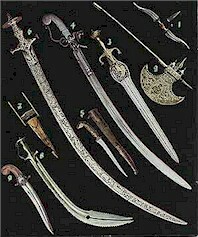 Now, I knew, that it was a requirement that at all times, men of the Sikh religion are required to carry a knife. However, in this parade most people had something longer than a knife-- swords, spears, halberds, shields, I even saw a morning star. wanted to find our hotel and with all the distraction is was really difficult. We went back and forth many times looking for the hotel sign, in the direction the parade was moving, and against the tide. There was food stuff for sale in the shops along the sides, which in India spill out into the street, so it was really tough squeezing through, and no joke, some of the shops had vats of boiling oil we had to maneuver around! All this chaos meant that my girlfriend and I got separated several times. I suppose even this would have seemed cute if the weapons weren't actually being used. But they were. People were dancing wildly with their swords, jousting with their spears (a la the video!) and playing various versions of what we used to call on the playground, "chicken." Except it was "armed" Chicken. At one point I was walking with some guys with broad swords and one of them grabbed my arm and asked, "What religion are you?" My blood ran cold, "American," I said after hesitating. "But what religion?" he asked over and over, and each time I answered the same thing, "American." I pretended not to speak English and finally made a dash for my hotel. I later learned that this was a 15 mile long parade with over a million Sikhs. It was explained to me that if someone swings a sword at you, naturally you duck, and if it misses this is because God has protected you. If not, not. Ahhhhhh a little bit of warrior code, and a little bit of shamanic power.